Musical keys (major), in which tunes are played. In Newfoundland Labrador, G-C and A-D are the most common double row accordions. These rows are said to be tuned a "fourth" apart, where if the outer-row is in the key of G, and is labelled "1", counting up to "4" (G=1, A=2, B=3 and C=4) takes us to the key of C for the inner-row. Musical keys (minor), in which some tunes are played. The C-major collection (C, D, E, F, G, A and B) of notes is the same as the natural A-minor collection (A, B, C, D, E, F and G). Similarly the G-major collection (G, A, B, C, D, E and F#) is the same as the natural E-minor collection (E, F#, G, A, B, C and D). In addition to the natural minor key, there are two other types of minor keys, involving a substitution or two of accidentals. Melody and melodic rhythm of tunes, when the treble buttons are correctly played in succession by the right hand, and the rhythm is associated with patterns of note duration. Embellishment, using individual notes. These may add interest to common tunes. This comes with experience and frequently involves rapid and short-duration finger movements, aided by the bellows and the air-control button or lever. Embellishment, using right-hand major and minor chords. For example, holding buttons 3,4 and 5, while pushing or closing the bellows, creates a happy and harmonious sound, a major chord. However, holding these same buttons while pulling or opening the bellows creates a rather sad sound, somewhat like the distant mournful horn of a departing train, and is referred to as a "natural" minor chord. If, however, you hold buttons 2, 3 and 4 as you pull or open the bellows, you get a sound that is neither happy nor interestingly mournful; it seems to be diminished with respect to both, and we call it a diminished chord. Different accordions can have very different arrangements of bass and chord buttons. With multi-row accordions, different groups of buttons primarily (but not exclusively) support different treble rows. Single-row accordions with two spoon-shaped buttons, or levers, yielding two bass notes and two chords. Single-row accordions with four buttons, yielding three bass notes and three chords. Double-row accordions with eight buttons, arranged in two vertical rows, yielding six bass notes and six chords. Triple-row accordions with twelve buttons, arranged in two vertical rows, often giving seven bass notes and nine chords. Different groups of bass and chord buttons can help augment the melodic rhythm by providing a rhythmic beat. The left-hand chords can enhance the harmonic content of the tune. The left-hand bass and chords can add interest by facilitating certain embellishments. When playing with other instruments in a group, the rhythmic use of the bass and chord buttons can help everyone stay in time with one another, which may be important if there is no drummer available. 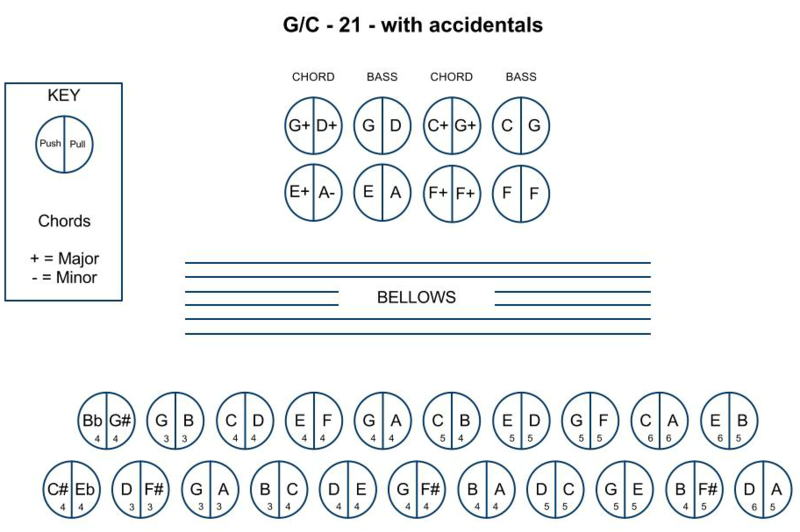 Although this site focuses on the double-row accordion, in keys such as G & C, A & D, D & G, and so on, there may be many of you who have single-row and triple-row instruments. Much of what I'm including on this site for the double-row accordion may still be of value to you. For example, the two inner treble rows of such triple-row accordions as the A-D-G Hohner Corona, are usually identical to the the two treble rows of such accordions as the D-G Hohner Erica. The four bottom buttons of the left-side of the A-D-G Corona usually contain the same bass and chord arrangement as the four-button left-side of the double-row D-G Hohner Erica. The Corona's outer treble-row and that row's bass-chord counterpart on the left side are different. As you hold the accordion to play, the treble buttons, providing the melody, are on your right, and the bass and chord buttons, which can enhance the rhythm and contribute to the tune's harmonic content, are on your left. The treble buttons are usually numbered from 1 to 11 (outside row) and from 1 to 10 (inside row), where 1 is the button near the chin. The left-hand inner-row bass and chord buttons can add additional interest and variety, including the enhancement of harmonic content, when played in conjunction with certain treble notes. 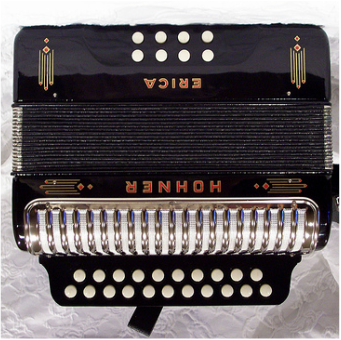 The layout for the very common (at least, in Newfoundland and Labrador) G-C accordion is shown below. This diagram was copied from the UK melodeon site mentioned earlier. If interested, CLICK HERE to check out their button-layout drawings for A-D, D-G and C-F accordions. It will open in a separate window, so you can easily move back and forth between sites. If you are playing the left-side mostly for rhythmic beat, then you can play Left (outer) button o1 & o1* for the chords, and Left (outer) button o2 & o2* for the bass. If you are playing the left-side mostly for rhythmic beat, then you can play Left (outer) button o3 & o3* for the chords, and Left (outer) button o4 & o4* for the bass. HEADS-UP: Remember, you were only asked to "consider" each matching of treble with bass & chords. The real question in each case is: "Does it sound great?" If it does, use it; if not, try something else, until you find a matching that is satisfactory for the tune you are playing. There are other, less frequently used, chord possibilities. For example, the left-hand chords on my accordions are all three-note chords (or triads), consisting of the first, third and fifth notes of their scale. The discussion and conclusions above fail to take account of the fact that, in some cases, it is possible to form four-note chords by playing a left chord button, such as i3*, and a right treble button, such as o1*, to form a four-note chord, in this case an F7 (dominant) . This increases the number of possible harmonic matchings, though not by very many for double-row accordions. Those of you with triple-row diatonic accordions will have more options of this type. Some button accordions have a "stop" on the left, which gives the option of removing the "third" of a three-note chord, leaving only the "first" and the "fifth" notes. It is the "third" that determines whether a chord is major or minor, and thus removing it gives a reduced "chord" that can be used for tunes that call for a number of minor chords.